Did you know that over half of the fires that occur every year are caused by electrical problems? All too often, people don't realize their electrical system can malfunction until it's too late. That's why we encourage all of our clients to schedule regular electrical testing. 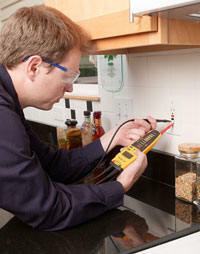 We can also correct your electrical system code violations. These violations will be noticed at a home inspection weather you are buying or selling a home. A qualified electrical contractor will be happy to update your electrical system to meet national and local electric code. Contact Sylvia Electrical today to schedule a licensed electrician to conduct a full electrical testing of your home of business. Sometimes the electrical current in your home may undergo a surge or spike where the level of current briefly rises above the designated flow of electricity. In the U.S. the designated electrical voltage for your home is 120 volts. When the electrical current rises above this set voltage a power surge occurs. Sylvia Electrical has a licensed and qualified staff of electricians can provide and install a wide range of surge protectors that range from smaller units for the home to super protective commercial surge protectors that may save your business. Call Sylvia Electrical Contracting today to get protected.